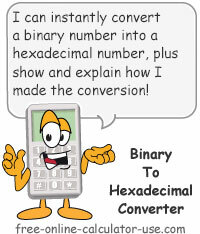 How to convert binary to hexadecimal. Example showing 5 easy steps. Enter the binary number you would like to convert into a hexadecimal number. Note that the entered number may only consist of ones and zeros, and the leading number must not be a zero. This is the hexadecimal equivalent to the entered binary number. Note that after clicking the Convert Binary to Hexadecimal button the binary to hex converter will display a detailed explanation of how it arrived at the result immediately below this line. This calculator will convert binary numbers into hexadecimal numbers and display a conversion chart to show how it calculated the answer. If you're not sure what a binary number is, or you would like to convert a binary number to a decimal number instead, please visit the binary to decimal conversion calculator for a more detailed explanation. Or, if you are not familiar with what a hexadecimal number is, please visit the decimal to hexadecimal conversion calculator page for a description. Enter the binary number you would like to convert into a hexadecimal number. Click the "Convert Binary to Hex" button. This will display the result of the conversion along with a conversion chart showing how the calculator arrived at the result. Number system that uses the base 2 system of expressing values, which consist only of the digits 0 and 1. Base 2 numbers are usually written with a subscripted 2 behind them (10102). The binary system is what electronic devices use for counting and displaying information, as their internal switches recognize a 0 as "off" and a 1 as "on." Each digit within a base 2 number is called a "bit" (comes from binary digit). Step #1: Working from right to left, split the binary number into groups of 4 digits. If the left-most grouping has less than 4 digits, make up the difference with zeros. To illustrate this step, as well as the steps that follow, we will use the binary number 11001101101. Note that 1 zero was added to the front of the left-most grouping to make it a group of 4 digits. Step #2: Populate the next row with "8 4 2 1" under each grouping. The 8-4-2-1 represents the binary place values for each of the four positions, the combination of which total up to 15 (the highest digit that can be used in a base 16 number, similar to the "9" in the decimal system). Step #3: Multiply the each digit in Row A by the corresponding place value in Row B and place the result in Row C.
Step #4: Add the products in Row C for each group of 4 and place the total in Row D.
Step #5: Change any values in Row D that are greater than 9 into the hexadecimal letter they are represented by. In hexadecimal notation, A=10, B=11, C=12, D=13, E=14, and F=15. Note that the above is how the binary to hex converter shows its work for each conversion. So you see, the binary number 11001101101 converts to the hexadecimal number 66D, which can be written as 66D16, 66Dh, or 0x66D.